"I remember talking to Dave and said; "I just want to be myself". I had been singing in an American accent and I thought; "This doesn’t feel right​"​ - Chas Hodges. 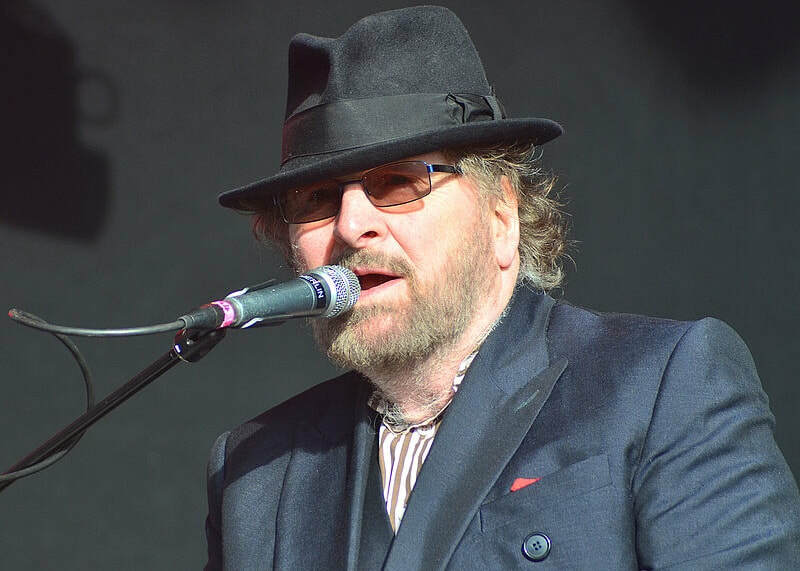 Following his sad passing in September 2018, we look back on our 2014 chat with 'Rockney' china, Chas Hodges. 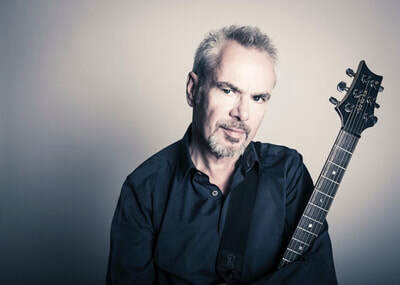 Though best remembered for his long serving partnership with Dave Peacock, the Londoner had worked with a variety of icons; both as a session musician, and band member. 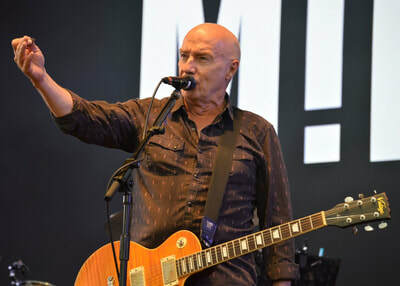 From touring with Jerry Lee Lewis, to sharing the stage with Richie Blackmore and Led Zeppelin and propping up The Rockers with Phil Lynott shortly before his death in 1986, his was a long and illustrious career. We spoke with Chas ahead of Chas & Dave's Sonisphere appearance to talk about all of the above. Gertcha; Eamon O’Neill. Hi Chas, it’s great to speak to you; should I call you “me old china”? You’re playing at Sonisphere this weekend in amongst all that metal; it must be one of the strangest bills that you’ve ever played on. Well, we fit in anywhere and everywhere. Someone said to us once when Pavarotti was going strong that we could go in the middle of a Pavarotti concert and go down a storm, and I thought; yeah, we could. So you can’t pigeonhole us. Over the years we’ve played all sorts of places. We do the punk festival most years up in Blackpool. It’s full of Punks and we go down an absolute storm. There’s stage diving and everything. We just fit right in there. Because we’re not like anybody else. We’re individual and I think that we’re obviously identifiable. There’s no one around that’s like us. Funny enough, it’s a return booking this one. We first done it in 1979. You last played at Knebworth on the bill at Led Zeppelin’s last show. That’s right, yeah. So they must have liked us as they’ve booked us back. ​What do you remember about that show in 1979? I just remember loads of people, but we had to be rushed away because we were doing a TV show. We did it two weeks running. I remember watching a band called Commander Cody. They were great. They were on the second week, an American band. But we didn’t get to see Zeppelin because of the TV show. Are you going to stick around to see any of the bands this weekend? No I’ve got another gig afterwards in Chelmsford, a solo gig with Chas and His Band. Have you been doing that since Dave’s retirement / semi-retirement in 2009? Well, for years before Dave retired he sort of cut down on some of the gigs. Chas and His Band has actually been going quite a while alongside Chas & Dave. When Dave had a break I just sort of continued and I still do the odd gig now so it works out good. You are on the same stage as the American Band Slayer on Saturday. Are you familiar with them? No, I’m not. I know Iron Maiden are doing it. I’m familiar with them. Going back to your musical beginnings, and you and Dave worked with some interesting names as session musicians. When me and Dave first got together I was doing a load of sessions, and I swapped from bass to piano. So when people would ring me up for a bass session I would say, “oh I don’t play bass now Dave plays bass, I play piano or guitar.” So yeah, in the early days we were doing sessions alongside doing gigs to pay the rent. But way before I got together with Dave I was on the road with people like Jerry Lee Lewis and Gene Vincent and toured with The Beatles and Cliff Bennett & The Rebel Rousers, so yeah I had done quite a bit before me and Dave actually got together. Did you pick up any tricks or tips whilst playing with those acts? Yeah I was influenced by Jerry Lee. When I saw him when I was a kid I was in a skiffle group and when I saw him when he came to my home town of Edmonton I vowed I wanted to learn the piano then. It was great going on the road with him as his bass player, a perfect opportunity to learn piano as he was my all-time hero. Jerry Lee Lewis seems to come across as a bit of a crazy character. Well he never did with me. I never witnessed it, but yeah, he’s been in a few scrapes over the years. But with me and him, it was just pure music. He knew I knew his music and he respected me as a musician, so we’ve always got on great together. You were also in The Outlaws with Ritchie Blackmore. That’s right. That was the first band I was ever in. That band formed in 1960 and Ritchie joined about ’62. We nicked him from Screaming Lord Sutch. We needed a guitar player and Sutch was an absolutely fantastic act. He never had any hit records but as far as drawing a crowd Sutch was the business. But we had seen Ritchie with him and when we needed a guitar player we got in touch with Ritchie and he came down and auditioned with the band and then joined. And was he a moody git back then? Well, no not really. We used to have a laugh together, I don’t know if you’ve ever seen the Telstar film [The Outlaws appeared as themselves in the 1963 film ‘Live It Up’], but we used to go through the thing of driving up and down the A4 chucking flower bags at people. He’s famously a notorious practical joker. He certainly was and I was quick to join in, so yeah we did pull a few pranks over the years. I couldn’t wait to join in. I was like that at school. If anybody was up for a laugh I was straight in there. But I mean we were virtually kids anyway and we hadn’t long left school so those pranks that you would play at school we just carried it on. Was that talent visible? Did you know that he was going to go on to be one of the most revered guitarists of all time? We knew that he was a top guitarist, that’s why we poached him from Sutch. But yeah, from the guitar players around he was one of the best. So yeah, it wasn’t a surprise when he became more famous. You also worked with Phil Lynott briefly in the early 1980’s in a band called ‘The Rockers’. He was a great lad. It was a real shame [when he died]. I never knew he was into drugs, I mean he never showed it to me. But he was just great. And he paid me a great compliment. When I was with Heads Hands & Feet as a bass player, he said that I was his favourite bass player. Anyway we got together for I think it was an EP, four tracks, me, Roy Wood, John Coughlan and Phil Lynott. We did four rock ‘n’ roll tracks. There were plans to do more but poor Phil disappeared off the earth and it all went flat. But we had a great time and he was a real, genuine, warm person. Yeah, I never sussed it at the time, he was just full of life and fun. He did keep it well hidden we never knew anything about it whatsoever. ​You haven’t played a lot of gigs since the retirement. Well Dave packed up for a while when his wife died. We didn’t retire. I carried on with Chas and His Band, but when somebody close to you dies you can’t see beyond the end of your nose for a while. But then as time goes on it gets a little bit easier, and that’s what’s happened with Dave so he’s back. But gigging is our life, and this is quite a long tour but its spread out so it’s quite easy really. I mean two or three gigs a week is fine and most of them we come home after the gig so it’s a nice relaxed tour. Are you both still based in London? Just outside, I live in a little village just outside of Stevenage and he’s not far from me. It’s a local gig for me. When they have a concert over there, I can just sit out on the porch and I can hear it all going on. It’s just a walk over the road. I wanted to ask you about a kids TV show called 'Bangers And Mash'. 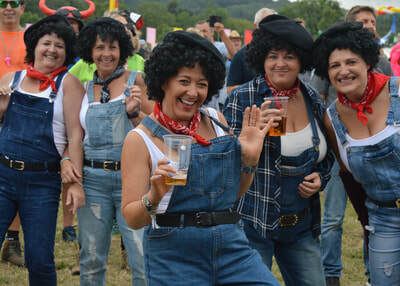 ​You’ve got such an identifiable sound that you know straight away that it’s Chas & Dave. Well, we must have done something right. I mean that’s what we set out to do. I remember talking to Dave before we got together and said I just want to be myself now. I had been singing in an American accent like most people did, and it was when I toured America with Heads Hands & Feet and I was singing in this American accent to Americans that I thought this doesn’t feel right, I’ve got to start singing in my own accent and so that was the start of it. So straight away the identity was there because it was actually ‘us’ coming out. But we weren’t thinking about becoming famous or having a hit, we were just playing the pubs and clubs around London and enjoying ourselves and the rent was getting paid and we were becoming ‘Chas & Dave’, if you like. You’ve been together for a long time now. I’ve actually known Dave fifty years, and I first met him when I was with Jerry Lee Lewis on tour, and we knew each other for almost ten years before we decided to get together. But we were both bass players so we didn’t think of getting together professionally. But once I decided to drop bass in general and go on to piano as my main instrument that was when we got together. We’d both been in bands that would just get started and then they’d all split up, but we knew that once we got together we’d be together for life which is the case and it’s why we’re still together now. We’ve been together forty years me and Dave. I felt that was right at the beginning and it still feels right. And you’re still going strong. Yeah it’s great. As long as I’m fit enough I shall keep on playing. I feel really fit. I’m behaving myself drink-wise now. I used to overdo it ten, fifteen, twenty years ago. I still have a beer but I keep off the spirits. All those things you learn over the years. And I’ve got my allotment going round the corner and I’ve written books about that as well, so that keeps me going. As far as fitness is concerned I feel fitter now that I’ve done for years. I felt less fit twenty-five years ago. So if you’re fit enough, you look forward to gigging and gigging helps you, you know playing a piano is quite physical so that all helps to keep your limbs working. Finally, you’re practically saints in the East End of London now, so is an OBE on the cards? [*laughd*] Well, a few people have mentioned that. I mean, if there is, there is. We’ve had a lot of other sort of, pats on the back, so we’ll wait and see.